When it comes to my friends and I, most of the time it's spent indoors baking, chatting, gossiping and online shopping believe it or not. I've always enjoyed sleepovers and pampering nights. A survey which was carried out to 2000 women in the UK show that 70% agree with it too and only 30% prefer a night out into Town. Let's face it, Guys prefer to go down to the bar for a beer and a manly chat or watch football where on the other hands us ladies either go on shopping spree's, lunch or a typical pampering session full of gossip, chit chat and anything girly. My Girls Night In would include the lot; Party Food which would obviously include yummy delicious cupcakes followed by Takeaway (we cannot starve ourselves to death can we), Magazines to drool over anything by Marc Jacobs to Louis Vuitton's new Handbag collection to Chanel's new Fragrance, Chick Flicks movies and last but never the least a ton of beauty products to play with. Let's be honest with ourselves, It is not a Night In without a sleepover bag, PJ's and a whole lot of Beauty Products to pamper one another over cupcakes and Steamy Guy Gossip! When I was younger Sleepovers were the best back in High School, We'd spend most nights staying up most of the night chatting, laughing and planning trips together. Growing up it hasn't changed a bit, in fact it's a huge party when we all get together and spend a night pampering ourselves. 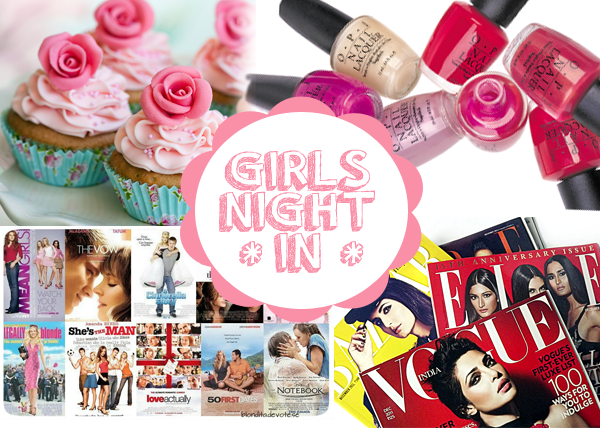 When was your last Girls Night In and what would you do on your night in with the ladies? I'd love you to share yours! I love girly nights in! For me it's the movies that make the evening, start the night with a brilliant new movie to enjoy and get everyone warmed up followed by a couple of old favourites that the whole group love and just quote the entire way through while eating pizza and finally just whack on a few bleh chick flicks to play in the background while we chat and plan and paint our nails and eventually fall asleep in the festoon of pillows and duvets that we made into our little den. ...and now I really need to have a girly night in!